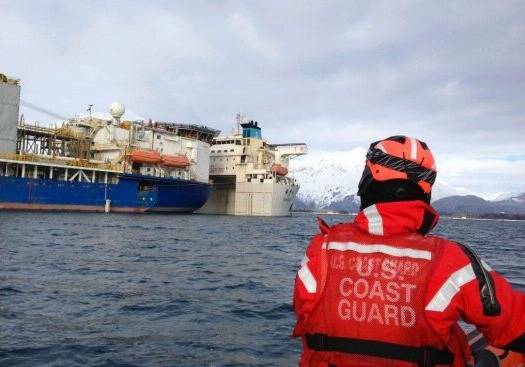 'Noble Discoverer', the massive drillship that is an integral part of Royal Dutch Shell's Arctic oil drilling ambitions, is getting a lift to Asia. The drill rig has been loaded onto the cargo deck of another vessel, the 708-foot Chinese-flagged heavy lift ship Xiang Yun Kou, which arrived in Resurrection Bay, not far from the Alaskan community of Seward, reports the Alaska Dispatch. Under the watchful eye of the Coast Guard, the Xiang Yun Kou began lowering itself into the water, until its cargo deck was completely submerged, allowing for the more than 500-foot-long Noble Discoverer to be loaded aboard. Then, the lift ship began releasing water and the Noble Discoverer was lifted into the air, and out of the water for the first time in months. The Noble Discoverer's time in Alaska has been mostly star-crossed says the Alaska Dispatch: last July, it lost anchor near the Aleutian community of Unalaska and drifted close to shore. Then, after taking a trip to the Arctic to begin exploratory drilling, it suffered a backfiring incident in the same community in November. Later that month, en route to a shipyard in Washington for winter maintenance, the ship -- operated by contractor Noble Corp -- suffered an issue with its propulsion system that necessitated a tow to Seward. There, Coast Guard inspectors boarded the ship and found numerous safety and pollution issues that could lead to legal action against Noble. © New Wave Media Int.